You’ll find special games linked to some Dizzy Rhino theme party kits, but have some general games ready in your party plan. Twister – always fun. 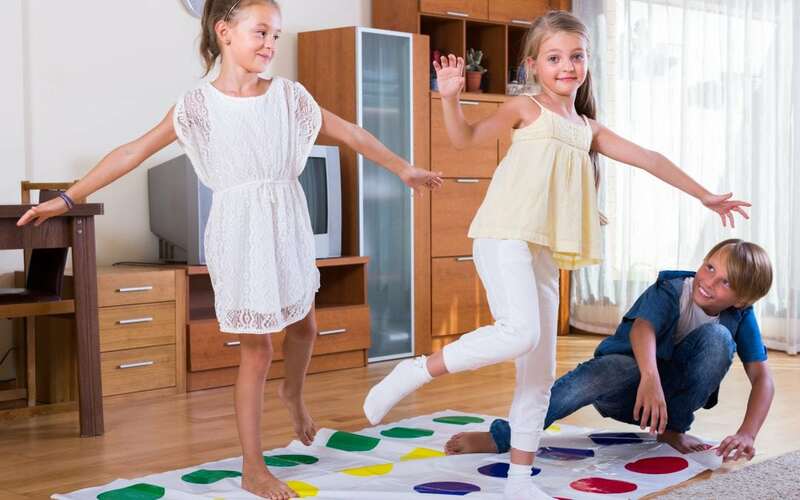 You can make your own Twister mat using paper plates stuck to a base mat, but a much sturdier version can be bought for about £10. Speed stacking. You need 12 sturdy unbreakable beakers for this game. Sport stacking cups are specially designed for faster times. A set costs from about £8 upwards. Watch YouTube or go to https://en.wikipedia.org/wiki/Sport_stacking for the rules. Charades. Have firm rules to keep it fun. You can play singly or in teams. The idea is to act out the title of a book, film, song or tv show in silence, until somebody guesses it. Or you can set a time limit. Guests can decide what they are going to act out, or you can put titles in a hat for them to pick. This works better with younger children. It can save them from choosing an impossible subject as long as you’re sure they will know the title. Wink assassin – a good icebreaker. Deal out some playing cards, including a joker, to each guest. The person who gets the joker is the ‘wink assassin’ able to kill with just a wink. Everyone walks around the room, chatting and making eye contact with each other. The assassin must try to wink at someone, without anyone else seeing. When someone receives a wink from the murderer, that person must ‘die’ by falling to the ground dramatically and, preferably, amusingly. They can wait five seconds before they keel over to make it harder identify the assassin. The ‘dead’ person leaves the game. If anyone thinks they know who the murderer is they shout: ‘I accuse’ and name their suspect. The accused must answer. If they are innocent, the accuser is out. If they are guilty, the game restarts with a new villain. The game continues until the killer is identified or there is only one man standing! Sleeping beauty – a version of Dead Lions for older children. Everyone lies on the floor. They are allowed to talk quietly, but nobody must laugh. Once they laugh they are out. Of course, the idea of the game is to make your fellow guests laugh. The referee will be looking for tell-tale signs of suppressed laughter, too. This game would work well while guests are relaxing with a Dizzy Rhino Natural Cleansing Face Mask. Guess who – another game for quiet moments in a Dizzy Rhino Pamper Me party. Write the name of celebrities or tv, movie or historical characters on stickers. Everyone has a sticker placed on their forehead without them seeing it. The aim of the game is to guess who are. You can ask any question that can be answered by ‘Yes’ or ‘No’. This continues around the circle, with each guest asking a single question, for example ‘Am I a girl?’ or ‘Am I a singer?. Once they think they know who they are, they can ask: ‘Am I …?’ when their turn comes round. First person to guess right is the winner.